Summer is just getting started. It feels like summer is just getting started. In fact, things are really heating up around our part of the world. Time to get out in a swim suit and enjoy cooling off in the pool. Luckily I was sent a Flex Belt to review, just in time for this part of the year. Everyone wants a nice tummy, but it’s a hard area to work out. And if you are busy with vacations, work, and daily life, it can be hard to find time to do traditional ab workouts. 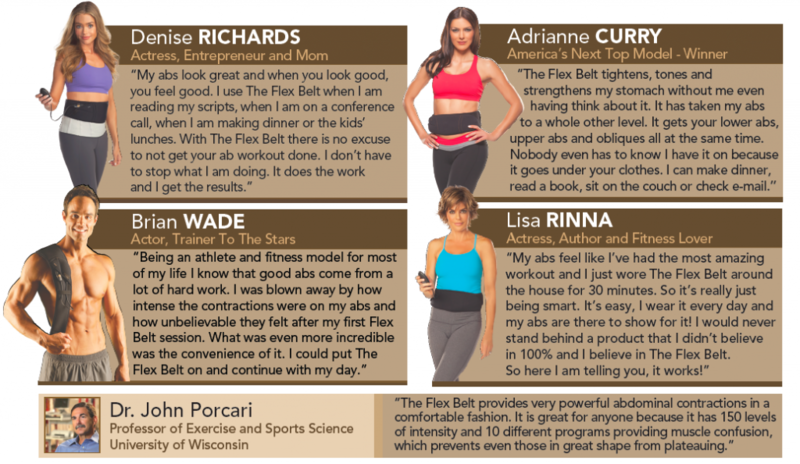 The Flex Belt fixes part of that problem because you can wear it around while you do your work, all the while letting it contract your muscles and work your abs! Also, it’s the first EMS (Electric Muscle Stimulation) product of its kind cleared by the FDA as a class II medical device for direct to consumer sales. It’s the real deal! In fact, athletes and celebrities use it too, that’s how good it is. I will be honest, it feels a little strange at first because your muscles are contracting but you aren’t the one causing them to do it! I could feel it though, and I think that the more I use it the better my muscle tone will be. The FlexBelt is pretty straight forward, and it comes with everything you need. I liked that it even included a nice pouch to keep it in when not in use. The FlexBelt website also has tips and videos to help you get started. I’ll have to check in with an update in a few weeks when I have been able to consistently use it, but right now my husband and I are kind of fighting over it! Yes, it’s great for men or women! Have you ever used a FlexBelt? Isn’t it amazing? Disclosure: I received a FlexBelt in exchange for my honest review. Next postOf blogging and other things.